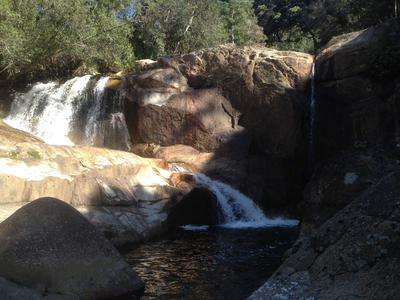 This place is one of Tassie’s hidden gems. Even though it is only a 15 minute walk off the Tasman Highway between Weldborough (near Pyengana and St Columba Falls) and Moorina, it is known to very few people and is quite hard to find. The “track” starts next to a steep 4WD road on the right (coming from Weldborough). There is a small pullout here. Look for a pink tape marking the start of the walk. From here, the track drops steeply into the valley. It is important to keep an eye out for the pink tapes, as it can be quite easy to meander off the trail and get lost. 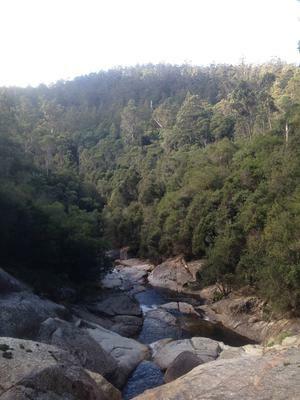 After about 15 minutes of walking, we reached the top of the falls, where the view of the falls are very ordinary. 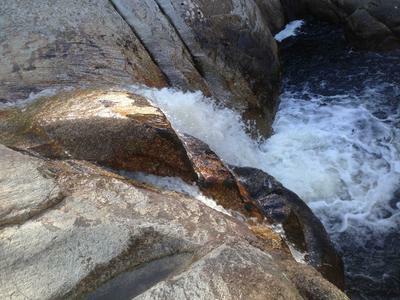 The only way to get down to get a good view of the falls is via a steep scramble down the granite (I think) cliff face. I made it down easily enough, although mum wasn’t so enthusiastic about coming down. The falls itself was a very good reward for effort. It consisted of a 10 metre high upper tier, as well as a small 3-4 metre lower drop. The falls also possessed some very good power, which was surprising as our visit came in the middle of April, one of the driest months of the year. 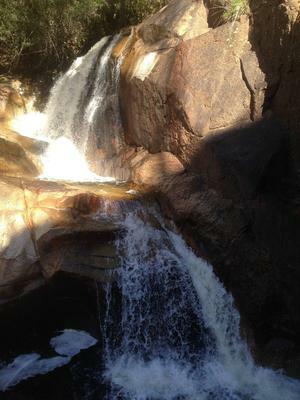 Overall a picturesque falls located in a beautiful area.